Mexico has about 6,000 miles of coastline and over 450 beaches with a variety of physical characteristics. These range from desert to tropical environments but while it may be easy to classify beaches according to these objective characteristics, the choice of which beach resort is best for a vacation is much more subjective. A quick internet search will turn up several sites that rate beaches in Mexico by a variety of different criteria but there is only one objective system that rates beaches by strict criteria applied the world over and that site can be found at http://www.blueflag.org. Their system for evaluating beaches started in France around 1985 and is now run by the European Foundation for Environmental Education. In general, the Blue Flag criteria used to determine which beaches deserve to be awarded are water quality, safety, services, environmental management and information. 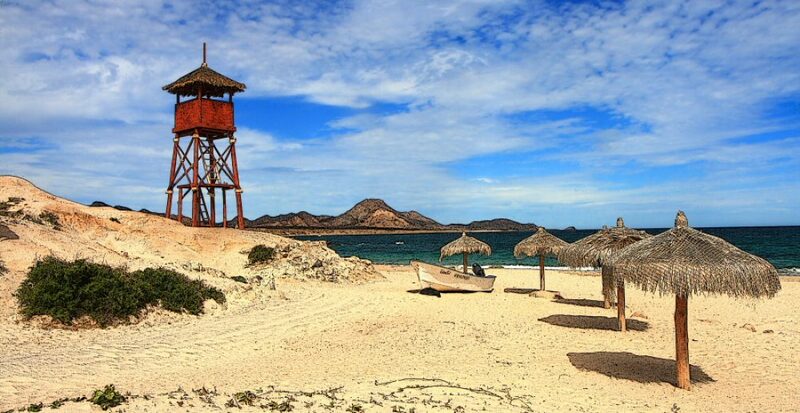 As of now, there are 5 beaches that have earned the blue flag award in Mexico. Coincidently, all five of these beaches are also on the list of the best beaches in Mexico as published by websites such as Travelers Choice and magazines such as U.S News and Travel that use tourist opinions or travel writers opinions to rate beaches. So, if finding the best beach is a top priority on your next vacation, it comes down to a decision about the intangibles such as idyllic versus the tangibles such as environmental information signs. In the photo essay below there is a photo of Playa Delfines, a blue flag awarded beach, as well as several photos of beaches in Tulum which Travelers Choice rates as the best in Mexico. All other beach photos below are highly rated by one or more survey about best beaches in Mexico. Playa Akumal, a top choice for snorkeling and protected area for turtle nesting . This entry was posted in Eco-Tourism, Landscapes and Seascapes, Sunsets and Sunrises, Travel and tagged Beaches, Caribbean, coral reefs, eco-tourism, environment, kiteboarding, maya, mexico, nature, ocean, pacific ocean, riviera, sea of cortez, snorkeling, travel by www.thenaturalsite.com. Bookmark the permalink.